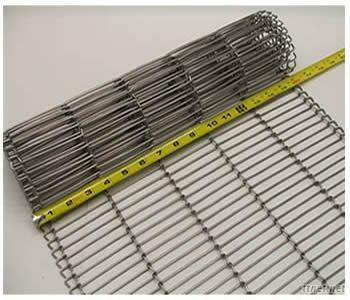 Rod network belts, also known as enrober conveyor belts or flat flex conveyor belts, feature specially designed "Z-bend" joints in the wire mesh. They are perfect for transporting light and medium weight products in food processing industries. High open structure - high proportion of open area up to 86% makes the belt efficient in cooling, drying, heating applications. Positive drive without slipping - Rod network belts are normally driven by sprockets positively without need for complicated tracking mechanisms. Stable conveying - With smallest diameter end rolls and drive rolls, the rod network belts provide stable conveying of delicate products. A wide range of sizes - Various sizes with different openness to suit different applications providing superb strength and min contact surface between the products and the belts. Generally, the more the joints cross the width, the stronger the belt. Lower belt mass - low belt mass than balanced weave belts for lower power consumption, faster processing and more product throughput. Cost saving - The high open structure without hidden crevices makes the belt easy to clean and maintain which result in considerable cost saving.